There’s more to the Philippines’ than white sands and blue paradise-like seas. Head inland after you’ve got off your Manila flight. When you book a plane to Manila, images of white sands, sparkling blue seas and sun beds under idyllic palm trees usually spring to mind. However, the islands of Boracay and Palawan draw partying backpackers like the clichéd moth to a flame, so why not head inland when visiting the world’s second largest archipelago to get away from the crowds and experience a less beaten path? We know straying from the picture-perfect beaches isn’t at the top of your agenda when heading to a nation of over 7,000 islands, but there’s a whole lot more to this country than swinging on a hammock with a Banana Shake in hand. Forget about those beaches for the time being, here are four reasons to head inland after landing in Manila. There are plenty of isolated, traditional villages in the foothills and jungles of the Filipino landscape that are definitely worth the visit if you want to get a real taste for the old country. You can choose to go with a group and a tour, or go solo in search of villages where they still farm by hand and loincloths are the norm. Be aware that if you do choose to steer clear of the usual villages that travellers visit, you’ll need to find yourself a local guide and be prepared for a lot of walking. The rice terraces of the Philippines are praised as one of the eight wonders of the world, and are routinely missed by travellers to the country due to their distance from the urban hub of Manila. These rice terraces were carved into the mountain 2,000 years ago and are said to spread around the world if they were laid end to end. The best places to see these terraces, trek along paths where you won’t see a soul for days and chat with the locals over a tea are in Banaue and Batad – nine hours north of the capital. Okay, so this means going to the beach, but instead of sliding your sunnies up your nose, delving into a great book and bronzing yourself (it’s tempting, but hear us out), grab yourself a snorkel and go wreck hunting. It won’t take long before you find something to explore – the coastal shallows of Palawan are littered with sunken battleships from when Japan and the USA were fighting over the Pacific. Be sure to take a waterproof camera. 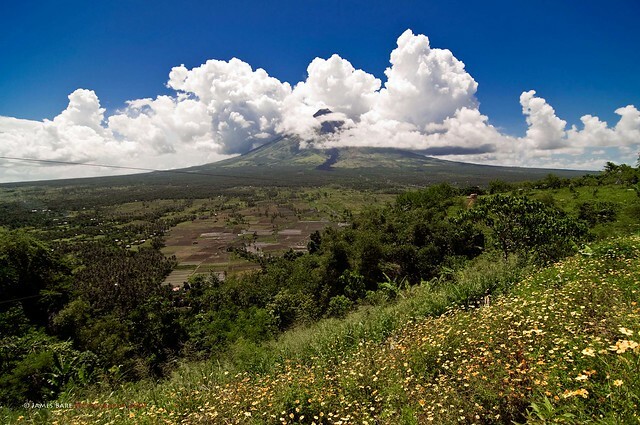 Mount Mayon, also known as Mayon Volcano, is an active volcano located in the province of Albay, on the island of Luzon. The volcano is 2,462 metres tall and is part of the Pacific Ring of Fire. Mount Mayon happens to be the most active volcano in the Philippines having erupted more than 48 times in the past 400 years. While the natural scenery is beautiful, the views of the volcano are best enjoyed from a distance as there has been unexpected volcanic activity and this poses a serious threat to hikers. The Tubbataha Reef is a stunning atoll coral reef and natural marine park located in the Sulu Sea. The reef is located about 150 kilometers from Puerto Princessa in Palawan, and it is one of the best diving spots in the country. The reef contains hundreds of different fish, coral, shark, dolphin and whale species. 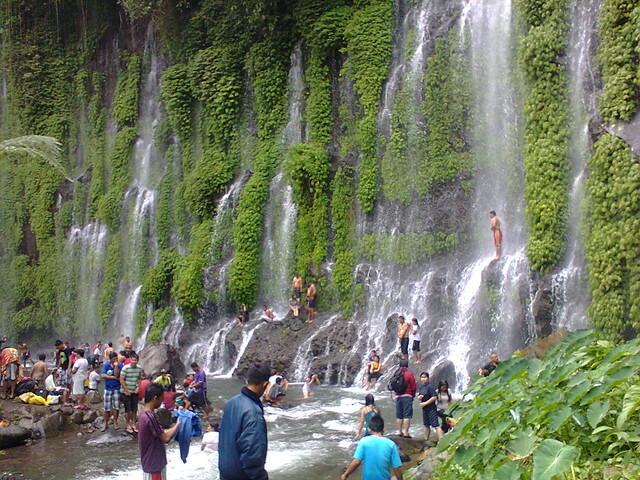 Located in Alamada in the province of Cotabato, this set of waterfalls has only recently been discovered but is already drawing guests from far and wide. What is unique about these falls is that the water sprouts from the rock and then pours down the mountain as a mist and light splash of water. It takes some work to get here, but the end result is very rewarding. Boracay is world-renowned for having some of the most beautiful beaches on this planet. With its fine white sands and warm crystalline waters, it’s a favourite destination for travellers in search of a tropical paradise. 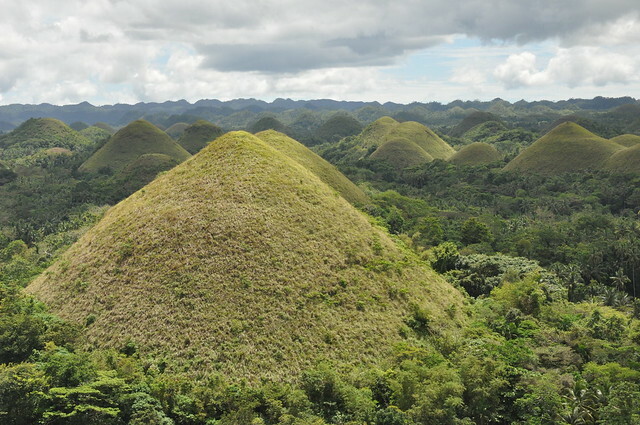 The chocolate hills are a formation in the Bohol province. The hills are usually covered in grass but when the weather changes in the dry season, the grass dries and hills turns brown earning them the name due to their resemblance to hills of chocolate. The mounds all vary in size, and estimates state that there are anywhere between 1,200 to about 1,700 of these chocolate hills. In the heart of the island of Bohol, there are nearly 2,000 limestone bumps just waiting to be climbed. These bumps are all uniform in shape and range from 30 to 50 metres in height; the result of hundreds of years of water erosion, they contain many an underwater fossil. For the romantics out there, local legend says that Arogo, a young giant, fell in love with a mortal girl by the name of Aloya. After she died, Arogo’s heartbroken tears left the Chocolate Hills as a permanent reminder of his grief.